It has been suggested that this article be merged into Chancellor of Germany. (Discuss) Proposed since January 2019. The Federal Chancellor of the Federal Republic of Germany (in German called Bundeskanzler(in), meaning 'Federal Chancellor', or Kanzler(in) for short) is, under the German 1949 Constitution, the head of government of Germany. Historically, the office has evolved from the office of chancellor (German: Kanzler, later Reichskanzler, meaning 'Chancellor of the Realm') that was originally established in the North German Confederation in 1867. The 1949 Constitution increased the role of the chancellor compared to the 1919 Weimar Constitution by making the chancellor much more independent of the influence of the President and granting the chancellor the right to set the guidelines for all policy areas, thus making the chancellor the real chief executive. The role is generally comparable to that of a prime minister in other parliamentary democracies. The 8th and current Chancellor of the Federal Republic of Germany is Angela Merkel, who was elected in 2005 and re-elected in 2009, 2013 and 2018. She is the first female chancellor since the establishment of the original office in 1867 and is known in German as Bundeskanzlerin, the feminine form of Bundeskanzler. Merkel is also the first chancellor elected since the fall of the Berlin Wall to have been raised in the former East Germany. The office of chancellor has a long history, stemming back to the Holy Roman Empire. The title was at times used in several states of German-speaking Europe. The power and influence of this office varied strongly over time. Otto von Bismarck in particular had a great amount of power, but it was not until 1949 that the chancellor was established as the central executive authority of Germany. Due to his administrative tasks, the head of the chapel of the imperial palace during the Holy Roman Empire was called chancellor. The Archbishop of Mainz was German chancellor until the end of the Holy Roman Empire in 1806 while the Archbishop of Cologne was Chancellor of Italy and the Archbishop of Trier of Burgundy. These three Archbishops were also Prince-electors of the empire. Already in medieval times the chancellor had political power like Willigis of Mainz (Archchancellor 975–1011, regent for Otto III 991–994) or Rainald von Dassel (chancellor 1156–1162 and 1166–1167) under Frederick I. The modern office of chancellor was established with the North German Confederation, of which Otto von Bismarck became chancellor of the Confederation (official German title: Bundeskanzler) in 1867. After unification of Germany in 1871, the office became known in German as Reichskanzler ("Reich Chancellor", literally "Chancellor of the Realm"). Since the adoption of the current constitution of Germany (the "Basic Law" or "Grundgesetz") in 1949 the formal title of the office is once again Bundeskanzler (Federal Chancellor). See the article Chancellor for the etymology of the word. West Germany's 1949 constitution, the Basic Law (Grundgesetz), invests the Federal Chancellor (Bundeskanzler) with central executive authority. Since the 1961 election, the two major parties (CDU/CSU and SPD) call their leading candidates for the federal election "chancellor-candidate" (Kanzlerkandidat), although this is not an official term and any party can nominate a Kanzlerkandidat (even if that party has no chance at all of leading or even becoming part of a government coalition). The Federal Government (Bundesregierung) consists of the Federal Chancellor and their cabinet ministers, called Bundesminister (Federal Ministers). The chancellor's authority emanates from the provisions of the Basic Law and from their status as leader of the party (or coalition of parties) holding a majority of seats in the Bundestag ("Federal Diet", the lower house of the German Federal Parliament). With the exception of Helmut Schmidt, the chancellor has usually also been chairman of their own party. This was the case with Chancellor Gerhard Schröder from 1999 until he resigned the chairmanship of the SPD in 2004. The first chancellor, Konrad Adenauer, set many precedents that continue today and established the chancellorship as the clear focus of power in Germany. Under the provisions of the Basic Law giving him the power to set guidelines for all fields of policy, Adenauer arrogated nearly all major decisions to himself. He often treated his ministers as mere extensions of his authority rather than colleagues. While his successors have tended to be less domineering, the chancellor has acquired enough ex officio authority (in addition to his/her constitutional powers) that Germany is often described by constitutional law experts as a "chancellor democracy". The chancellor determines the composition of the Federal Cabinet. The President formally appoints and dismisses cabinet ministers, on the recommendation of the chancellor; no parliamentary approval is needed. According to the Basic Law, the chancellor may set the number of cabinet ministers and dictate their specific duties. Chancellor Ludwig Erhard had the largest cabinet, with 22 ministers, in the mid-1960s. Helmut Kohl presided over 17 ministers at the start of his fourth term in 1994; the 2002 cabinet, the second of Chancellor Gerhard Schröder, had 13 ministers, and the Angela Merkel cabinet as of 22 November 2005 had 15. The "chancellor principle" makes the chancellor responsible for all government policies; this is also known as the Richtlinienkompetenz (roughly translated as "guideline setting competence"). Any formal policy guidelines issued by the chancellor are legally binding directives that cabinet ministers must implement. Cabinet ministers are expected to introduce specific policies at the ministerial level that reflect the chancellor's broader guidelines. The "principle of ministerial autonomy" entrusts each minister with the freedom to supervise departmental operations and prepare legislative proposals without cabinet interference so long as the minister's policies are consistent with the chancellor's broader guidelines. The "cabinet principle" calls for disagreements between federal ministers over jurisdictional or budgetary matters to be settled by the cabinet. Whenever the office of Chancellor has fallen vacant, which happens if the Chancellor dies or resigns, or if a newly elected Bundestag ("Federal Diet", the German Parliament) meets for the first time, the Chancellor is elected by a majority of the members of the Bundestag upon the proposal of the President (Bundespräsident, literally "Federal President") ("1st voting phase"). This vote is one of the few cases in which a decision requires a majority of all elected members of the Bundestag, not just a majority of those assembled at the time. This is referred to as the Kanzlermehrheit ("chancellor majority"), and is intended to ensure the establishment of a stable government. It has in the past occasionally forced ill or pregnant members to attend parliament when a party's majority was only slim. Unlike regular voting by the Bundestag, the vote to elect the chancellor is by secret ballot. This is intended to ensure that the chancellor's majority does not depend on members of their party who might express support in a public setting but be internally opposed. If the nominee of the President is not elected, the Bundestag may elect its own nominee within fourteen days ("2nd voting phase"). If no one is elected within this period, the Bundestag will hold a last ballot on the 15th day after the first ballot ("3rd voting phase"). If a candidate reaches the "chancellor majority", the President must appoint them. If not, the President may either appoint as Chancellor the candidate who received a plurality of votes (thus allowing the formation of a minority government) or call new elections for the Bundestag within 60 days. As all Chancellors have been elected on the first ballot, as yet (1949–2018) neither of these constitutional provisions has been applied. The Federal Chancellor is the only member of the federal government elected by the Bundestag. The other cabinet ministers (called Bundesminister, "Federal Ministers") are chosen by the Federal Chancellor, although they are formally appointed by the Federal President on the Federal Chancellor's recommendation. The Chancellor must appoint one of the cabinet ministers as Vice Chancellor, who may deputise for the Chancellor, if they are absent or unable to perform their duties. Although the Chancellor is theoretically free to choose any cabinet minister as Vice Chancellor, he or she prefers, in coalition governments the Vice Chancellor is usually the highest-ranking minister of the second biggest coalition party. Dear Mr. President, I take the political responsibility for mishandlings in context of the espionage affair "Guillaume" and declare my resignation from the office of Chancellor. At the same time, I ask you to accept my resignation immediately and to appoint my deputy, Federal Minister Scheel, as Acting Chancellor, until a successor is elected. Sincerely, Willy Brandt. President Heinemann followed the request. Walter Scheel was appointed as Acting Chancellor and served for nine days until the election of Helmut Schmidt on 16 May 1974. The 18th and current Vice Chancellor of Germany is Olaf Scholz, who also serves as Federal Minister of Finance in the Fourth Merkel cabinet. 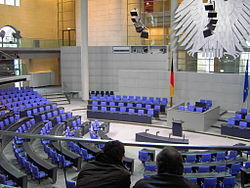 Unlike in other parliamentary legislatures, the Bundestag or Federal Diet (lower house of the German Federal Parliament) cannot remove the chancellor with a traditional motion of no confidence. Instead, the removal of a chancellor is only possible if a majority of the Bundestag members agree on a successor, who is then immediately sworn in as new Federal Chancellor. This procedure is called "constructive motion of no confidence" (konstruktives Misstrauensvotum) and was created to avoid the situation that existed in the Weimar Republic, when it was easier to gather a parliament majority willing to remove a government in office than to find a majority capable of supporting a new stable government. In order to garner legislative support in the Bundestag, the chancellor can also ask for a motion of confidence (Vertrauensfrage, literally "question of trust"), either combined with a legislative proposal or as a standalone vote. Only if such a vote fails may the Federal President dissolve the Bundestag. The correct style of address in German is Herr Bundeskanzler (male) or Frau Bundeskanzlerin (female). Use of the mixed form "Frau Bundeskanzler" was deprecated by the government in 2004 because it is regarded as impolite. Since 2001, the official residence of the Chancellor is the Federal Chancellery (Bundeskanzleramt) in Berlin. The former seat of the Federal Chancellery, the Palais Schaumburg in the former capital Bonn, now serves as a secondary official seat. The Chancellor's country retreat is Schloss Meseberg in the state of Brandenburg. Holding the third-highest state office available within the Federal Republic of Germany, the chancellor of Germany receives €220,000 per annum and a €22,000 bonus, i.e. one and two thirds of Salary Grade B11 (according to § 11 (1) a of the Federal Law on Ministers – Bundesministergesetz, BGBl. 1971 I p. 1166 and attachment IV to the Federal Law on Salaries of Officers – Bundesbesoldungsgesetz, BGBl. 2002 I p. 3020). ^ "Acting in accordance with the constitution". Regierungonline. The Press and Information Office of the Federal Government of Germany. Retrieved 9 March 2010. ^ "www.bundespraesident.de: Der Bundespräsident / Constitutional basis". www.bundespraesident.de. Retrieved 24 March 2018.